Toast, ricotta cheese, and kabocha puree. It doesn’t get much more simple than this, yet the combination of flavors and contrast of textures was blissful. I was satisfied and ready to call it an evening as it was so delicious. The toast is seasoned with olive oil and then pan-fried. This is exactly what I love about grilled cheese sandwiches, the crispy crust and the chewy dough. Handmade ricotta and a sweet yet slightly spicy kabocha topping makes this a homerun dish. I will try and recreate this tomorrow. I am sure that the olive oil pan-fried toast will become a regular part of our repertoire. Chef Dan Kluger, guest cheffing at the Park Hyatt Tokyo, said that it is so popular back in NYC at ABC Kitchen that some people request it for dessert. He said that the recipe is in the NY Times, NY magazine, and Bon Appetit magazine. It is also on the Today Show website and other places. Suddenly I feel as though I was a bear who has hibernated through a season of culinary greatness. In an interview with Metropolis magazine, Kluger says that among his favorite cookbooks is Jean-Georges Vongerichten’s Simple Cuisine. 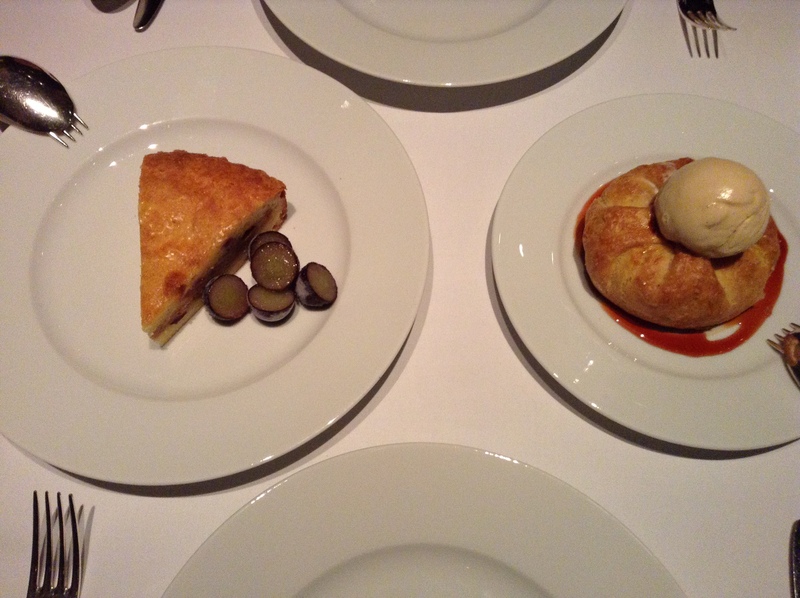 And some of the basic concepts that Jean-Georges uses are reflected in Kluger’s dishes. The mushroom pizza was just such a dish. 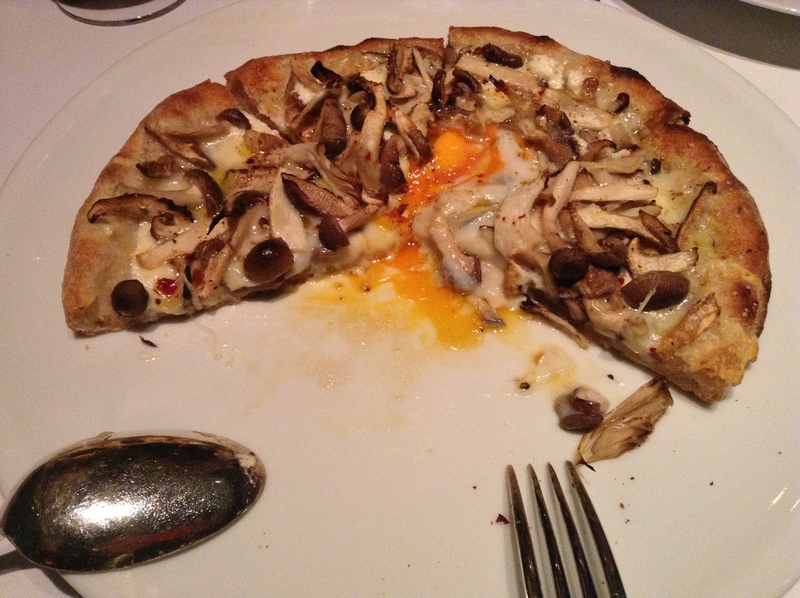 A whole-wheat crust with shiitake, shimeji, maitake, and eringi mushrooms topped with an egg. 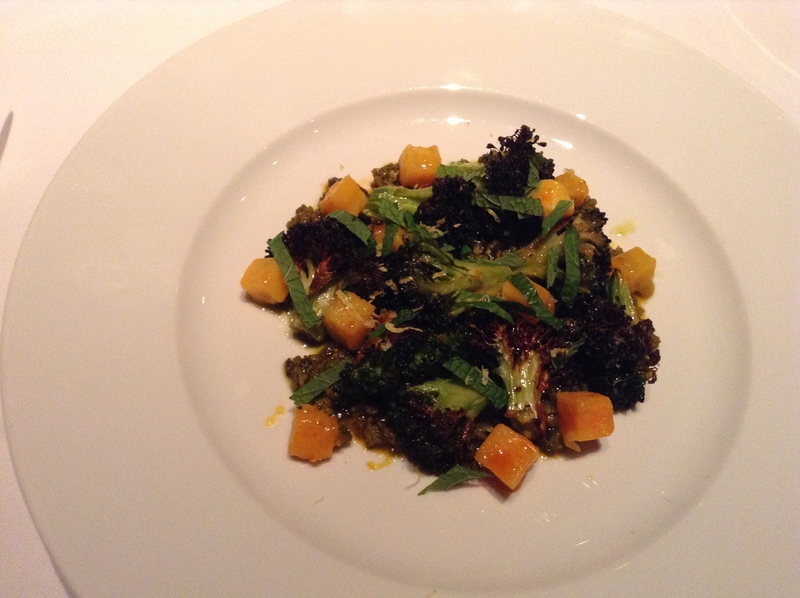 The produce shines and Kluger brings it together smartly. These two dishes are available at the New York Bar for the next two nights. In the main dining room, at the New York Grill, expect more layered dishes, yet still very simple. There are bursts of flavors and hints of chili, but never overpowering a dish. The grilled broccoli salad is also a technique I am going to try and do at home. It has been fun as a chef observing Kluger and his team prepare for this event through his visits to Tsukiji and Ohta Markets documented on the Park Hyatt Tokyo’s facebook page. It’s been even more thrilling to see the dishes come to life using ingredients like tilefish (amadai) and the grapes. 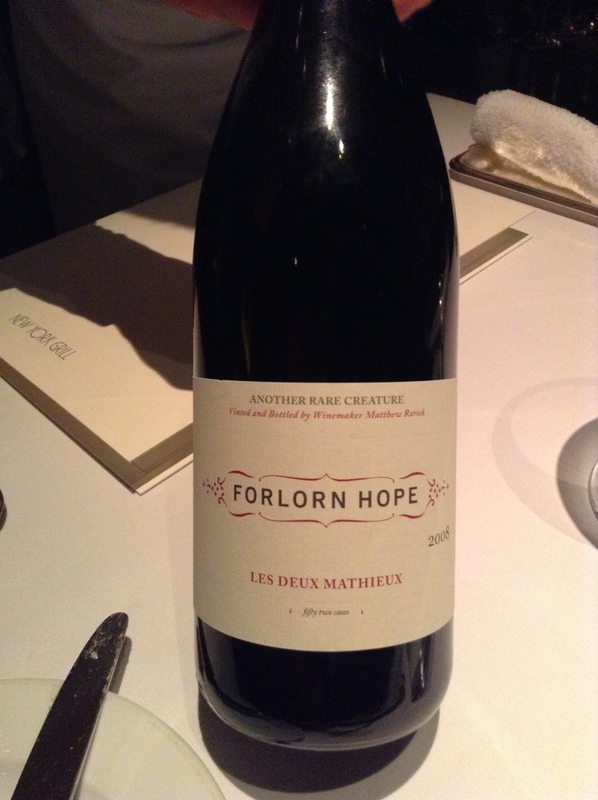 The wine pairings are fun as many of the wines are hand crafted and made in small batches like the spicy and fruity Forlorn Hope Les Deux Mathieux. ABC Kitchen is serving up a spicy ginger margarita and refreshing lemonade cocktail at the New York Bar along with that life-changing toast and mushroom pizza. There is a tasting course, or you can order dishes a la carte, at the New York Grill. Kluger and his team is only in town for two more nights. 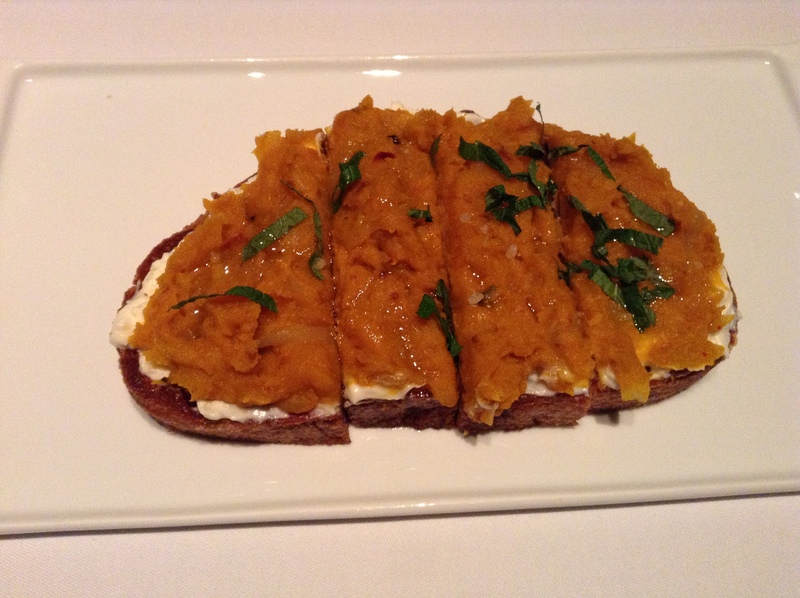 I am hoping to recreate ABC Kitchen in my home kitchen tomorrow with the kabocha toast. Arigato for the inspiration. I woke up thinking about the kabocha toast. What a revelation! Kudos chef Kluger.